AL-80A re-assembled, needing just 3-500Z and cover. As I wrote previously, my AL-80A needed a repair. The plate choke was burned, with several windings melted, the protective diode and capacitor on the B- rail to ground had gone open, and I'd found that the amp would not tune on 160m -- due to some melted switch contacts. I thought it might be a while before I could get around to doing this -- considering the last repair took about a year. However, since I had some parts on hand, I put the amplifier on the bench and got started. I replaced the capacitor with a fresh part, and installed a 1N5308 diode, as recommended by W8JI. And I mounted it on top of the board this time. Next part to arrive was the Ameritron Plate Choke (Part Number 10-15197). It was a thing of beauty, and despite the package having a nice accordion dent in one corner, was intact. Replacing the choke was actually pretty easy. 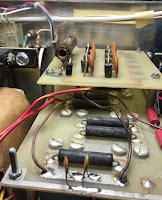 I figured out I had to unsolder the wire to the parasitic suppressor and plate cap connector, and then the two blocking capacitors. This was much easier with the tube removed. (I put the tube inside the plate choke's packing box). I then removed the mounting screw and unsoldered the high voltage and the bypass cap. Oh! 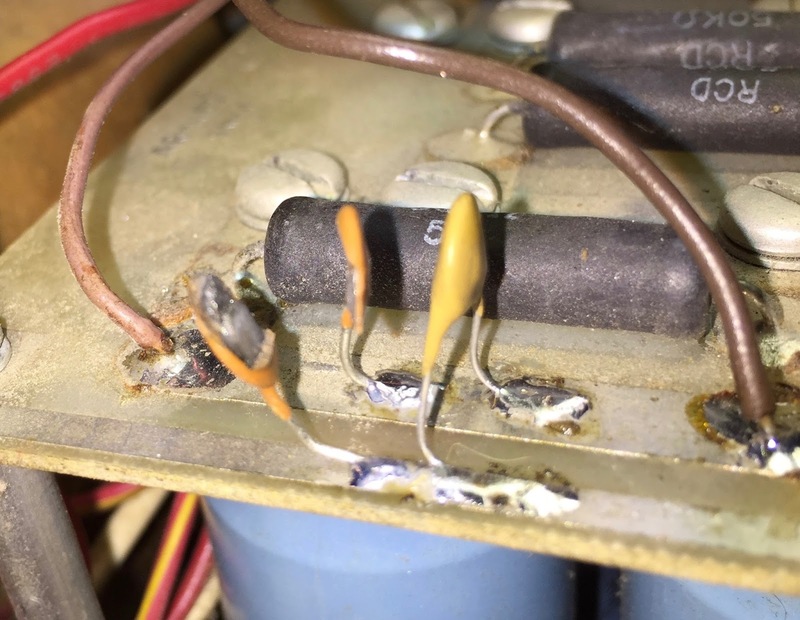 Did I mention that you need to unplug the amplifier and make sure the plate circuit is completely discharged before sticking your hands into the amplifier? No? Gosh, that would be dumb. Of course, you do that first. The old choke had a teflon washer under the ceramic, but it completely disintegrated when I removed the choke. I decided it wasn't required, and mounted the new choke directly to the sheet metal base. The new choke had a slightly different geometry with respect to the lugs at the base and top. 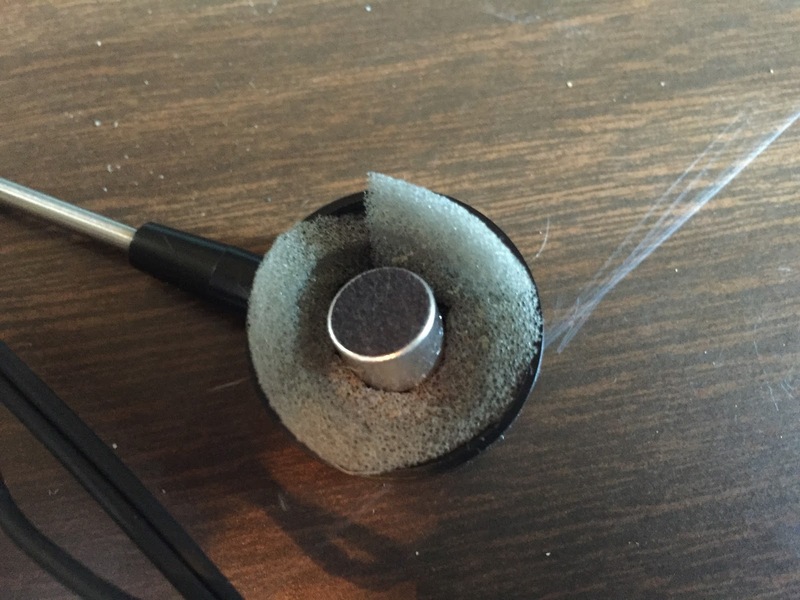 I decided to loosen the lug on the top and rotate it about 100 degrees. Otherwise, the blocking caps were not going to reach. 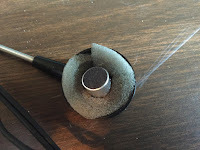 To move the lug, I first had to unwind the top end of the winding and re-wind it to the lug. I think the choke wire ends were unsoldered for this reason. Once in position, the lugs were easy to solder. The final task replaces the melted switch contacts. I must say I got a lot of positive answers from the Amps email reflector (amps@contesting.com). Their diagnosis of my issues was spot on, and I got a lot of helpful advice. 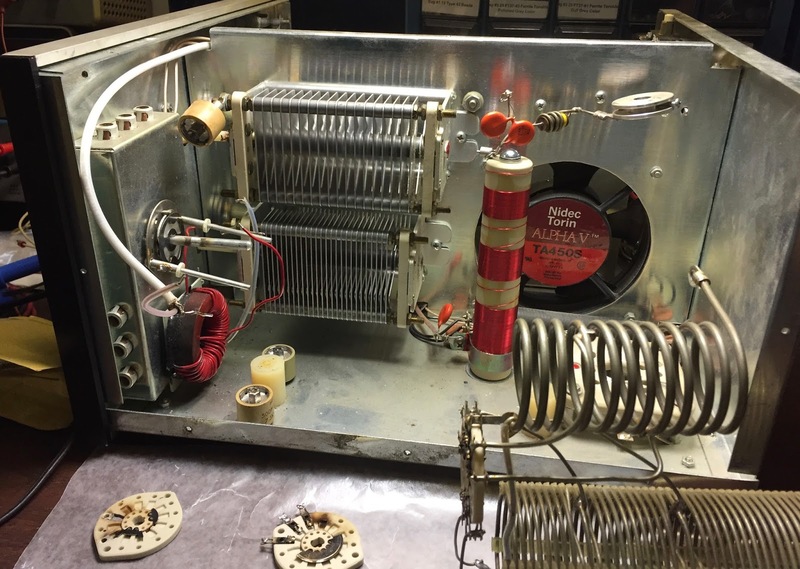 Vic Rosenthal 4X6GP sent a link to an article about band-switch arcing on the Heathkit SB-1000, which essentially was a clone of the AL-80A. He suggested I should add the corona washer, which would help prevent more melted switch contacts. From what I can tell, my AL-80A is a very early model, and it did not have this modification. George Hall N2CG also sent me an email with pictures of the washer. A huge thank you to goes to Louis Parascondolas, who not only wrote to me with suggestions on how to replace the switch contacts, but mailed me six contact elements (I needed four), plus the brass 2-56 hardware needed to secure them. Thank you, Louis! Switch wafers disassembled. This was the hard part. shown with contacts removed, and glued. Replacing a switch contact isn't a huge deal. The first step is to remove the switch wafer. That took some doing. I deduced I could accomplish this without doing a lot of desoldering and re-wiring. The rear bandswitch wafer is basically connected to the coils and a couple of padding capacitors. 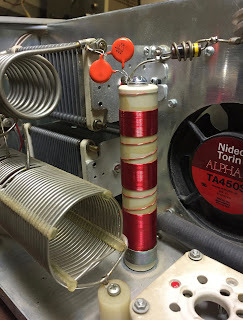 One end of each coil was fastened to the capacitor studs, which simply required removing a couple of nuts. The larger coil had two small phillips screws holding it to plastic mounting blocks. The padder capacitors could also be unscrewed from their lugs. Easy right? Not so fast! 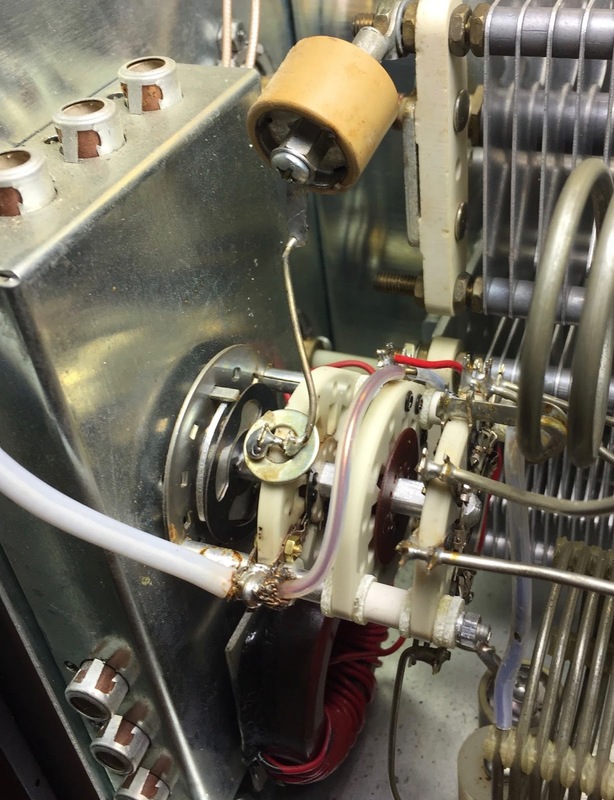 a single wire needed to be unsoldered connecting to the loading cap, and the rear switch wafer slid off with both coils attached. The second wafer just had three connections, easily desoldered: coax and coil end, coil tap, and the cap. Once those were removed, it slid off. The third wafer is the one we are after. I unscrewed the connection to the plate padder cap, and slid it off with the coax connection in place. That made it easier to unsolder the coax. Once you get these wafers off, you have to handle them very gingerly! They are delicate ceramic and can easily shatter. The tricky part is to remove the old contacts. I recommend a drill press and very small drill bits to drill out the rivets holding the contacts in place. Gradually go to larger bits until you have removed all of the rivet material. 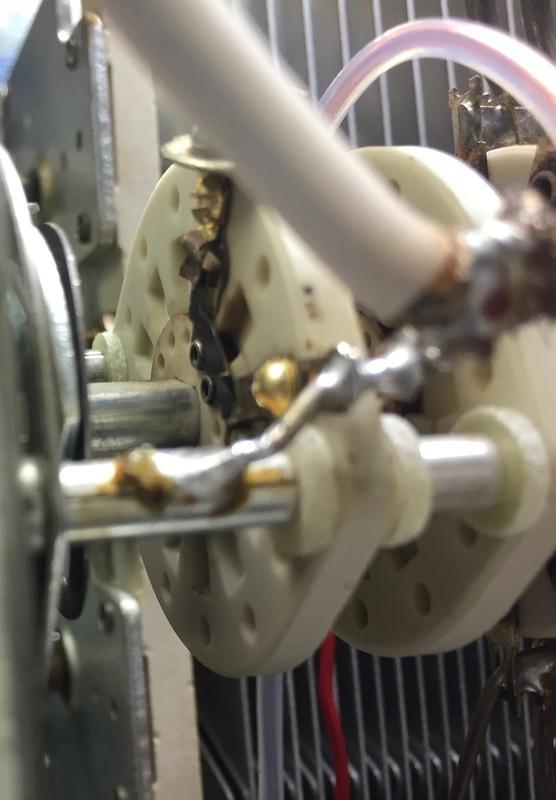 Go very slowly because you don't want to break the ceramic switch wafer. This is what I told myself, and I managed to get the contacts off with no trouble. I still had the shell of the rivet, which I carefully drilled out of the first hole. The last hole, of course, was a problem. I broke the switch wafer. New switch contacts engaged for 160m. I apparently said something aloud which brought my younger daughter into the basement to see if I was OK. (I was) The wafer was now in three pieces. What to do? I decided that I could glue the three pieces together, and it should hold. Superglue to the rescue! The glue took easily to the ceramic, and soon I couldn't tell where the split was. I cleaned as much of the burnt contact debris off the two switch wafers as I could. When I was done, you could not see any discoloration of the L network (second) wafer, but there was still a little in the contact well of the 160m padder (third) wafer. The contacted would cover that up. Adding the four contacts to the switch wafer was really easy. Getting all the switch wafers re-assembled was the hard bit. 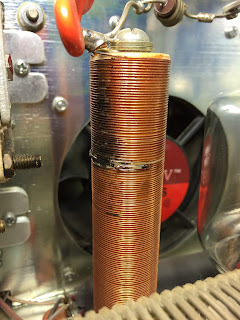 I added the coax ground connection to the 160m padder (third) wafer, but I held off on the padder capacitor connection until the very end, so I could place the corona washer. The L network (second) wafer was a bit problematic. I couldn't remember the orientation of the switching portion of this wafer, as there are two ways to put it on. Then I couldn't remember which wires went where. More pictures before disassembly would have been helpful. Studying the schematic made it clear which way things went. The bandswitch (first) wafer was easier. 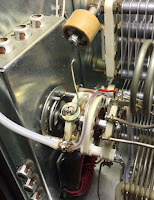 The tricky bit was soldering the connections to the loading capacitor. After any fix like this, there's always the moment of truth. No sparks turning it on, and a quick test on a dummy load proved it tuned up with no surprises on 160, 80, 40, 20, 15, 10, 12, and 17m. Ten minutes later, I had replaced all 13 cover screws and was already using the amp to chase DX on 40, 20 and 17m. Back in the early 1990s, I'd been contesting using a Kenwood MC-50 desktop microphone. It worked well enough. But long hours of contesting in one position became uncomfortable. 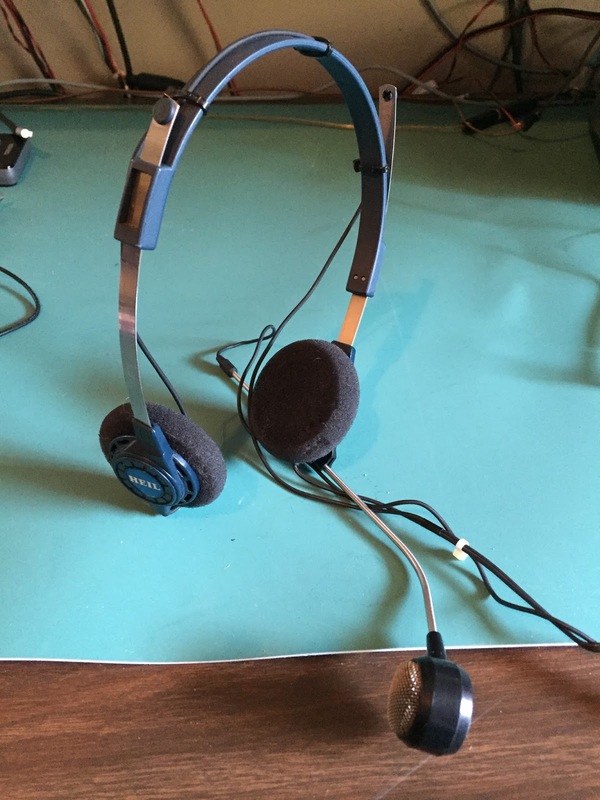 So, I decided I need a headset with a boom mic. Heil had recently come out with a lightweight headset, the Heil BM-10. For right at $100, I purchased one with the HC-4 element. The HC-4 was supposed to have a little bit more "punch", great for DX and contest work. I was immediately pleased with how it performed. I used that headset for many years, many enjoyable contests. It was pretty comfortable, although after several hours, even the light touch on the ears would cause a little irritation. The foam pads on the ears have been replaced a couple of times. And then, in December of 2007, it quit. The microphone element stopped working. I disassembled it, determined that the element wasn't working, and it sat. I wanted to order a replacement HC-4 element. After all, Heil used to sell them. But no more. After a while, I purchased a Heil Pro-set, perhaps one of the last ones made with the HC-4 element. It works spectacularly with the Elecraft K3. So the BM-10 laid disassembled, for a suitable microphone element. This past January, I ordered an electret microphone element from Ramsey Electronics. It was probably one of the last kits they sold. The kit came with a resistor and coupling capacitor to isolate the bias. The capacitor was far too large to fit inside the 8-pin DIN connector, so used a smaller unit from the junk box. I also replaced the boom mic clip. The original one had long ago cracked and was held together with a screw. Hell fortunately still sells them as a replacement part. I had to do some hunting to find the microphone cover. The headset had been disassembled so long all the parts weren't in the same place. Works like a champ. A bit of foam to keep the element from rattling around, and perhaps it is good for another dozen years or so. Shunt-feed wires rise up the side of the tower. For the last three years, near the end of summer, I have written about converging on 5BDXCC. I wasn't close when I only had thirty countries to confirm on 80m. The next year, I had inched a little closer, but taking the proposition a bit more seriously. And last year, I made some serious progress, and was hopeful I was within striking distance. Let's review the numbers, shall we? Last year I stood at 89/88, right? Well, turns out, this was slightly off. I discovered that a confirmation of CP1FF on 15m Phone was credited to 80m. This has since been corrected, so I was really at 88/87. Today, I hold 91/90. Yes! At least down to the last ten confirmations. Not a lot of progress from last year, but at least progress. I do have paper QSL confirmations for a couple more entities on 80m. According to ClubLog, I've worked 103 countries on 80m. Looking at the data, perhaps a couple of those have busted calls on one end or the other. This leaves me with two methods of achieving this goal: I can pursue getting paper confirmations from contacts I've already made, or I can strive to make more contacts and get LoTW confirmations from them. Let's look at the latter. 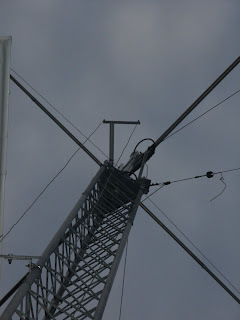 Last year, I ran into a few obstacles trying to work DX on 80m. Since moving from Floyd County to Walton County, I had to take down the 80/40m dipole and also the very effective 160/80/40m Inverted-L. The 80/40m dipole is up at the Walton County QTH, but the low height and local noise limits its usefulness. With the Gwinnett County QTH just minutes away, I've been more tempted to operate from there, when I can. The 160/80/40m Inverted-L and all the 30 lbs of radials are still sitting in a box. I don't really have a location to put it up right now. That leaves me with the shunt-feed tower for 80m. I ran into a number of issues last fall with the shunt-feed matching network. The 80m cap had to be replaced. I also found that the shunt isn't as effective as it might have been. Certain times of the early evening, the 80m dipole was much more effective. Plus, I'm seeing some RFI-related issues when using the shunt-fed tower. These didn't affect the Elecraft K2/100 or the Kenwood TS-430S, but they sure make a mess of the Elecraft K3/100. I also wanted to put up the K9AY loops with a new loop controller. The new loop controller didn't work properly, and even using the old mechanical switch, I discovered I had other RFI feedback from the K9AY loop feed line. Fix the Shunt-feed network. To improve matching on 80m, I'll add a relay and an extra variable capacitor, which would give me settings for 160m, 80m and 75m. I'll also bypass the control lines to prevent RFI ingress. Decoupling on the feed line couldn't hurt, either. Add Radials. 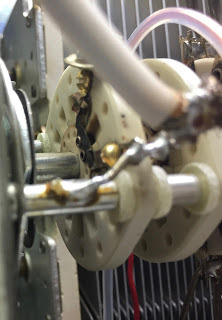 The 29 or so radials for the shunt-fed tower may have deteriorated in the last 15 years, and a few of them have been damaged. I have about 2,000 feet of surplus cloth-covered copper wire, and my plan is to put it ALL down as radials. 80m Dipole. I'm working on a design for a trap 80/40/20m dipole, which may double as a second-radio antenna. That should go back up where the old 80/40m was. Amplifier. One benefit of the 80m dipole is I can use the amplifier. The shunt-feed network can't handle much more than 100 watts. K9AY Loops. Fix the controller. Re-route the feed line to avoid RFI pick-up. Once all that is done, there's the small matter of being there. I guess I should start operating more from Walton County. Perhaps plan to work a few DX contests on 80m. Perhaps the ARRL DX contest would be good. How about the former? I've already used ClubLog and OQRS to request paper QSLs for a couple of the contacts for which I have matching information. Those should come eventually. Plus, I need to go through my batch of QSLs and see if I have anything matching on 80m. I think I did this exercise last year, but I've gotten some new QSLs from the bureau that I haven't processed yet. The final step is to use ClubLog to identify some of those contacts I've worked and not confirmed and request paper QSLs. Those may take a while to arrive, but at least I don't have to fix antennas or wait for propagation to get that done. There's that moment -- that moment of pure clarity. The pure clarity that occurs when you realize you've done something really stupid -- something stupid you can't take back. This happened yesterday. You see, I got off work early and thought I'd spend the afternoon chasing a little DX. I managed to work VP6J on 12m CW, and later they moved down to 17m RTTY. I've never worked Pitcairn using RTTY, so I was watching their frequency closely. They weren't strong, but I went ahead and set up the amplifier on a clear nearby frequency. The day was waning, and I figured if they ever came up a bit so I could get clear print, I'd want to give it my best shot. In the meantime, I moved down to 30m and worked some other stations. Of course, I switched the AL-80A to standby, and cranked up to 100 watts. Everything was fine. Until later I went back to 17m to see how VP6J was doing. Their signal had come up a bit, and I could actually read the print well enough to try for a contact. I reached over and flipped the amplifier to operate, and clicked the button to send my call. That's when I had my moment of clarity. There was a loud noise from the RF compartment of the AL-80A, along with several sparks, and abruptly, it went dark. An acrid burning smell hung loosely in the air. Certainly, something had gone wrong. I knew right away what I had done. 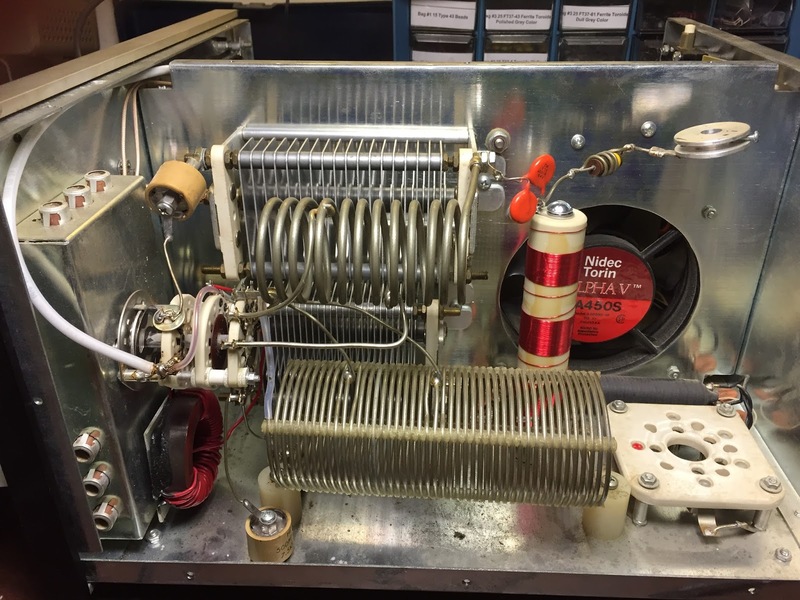 I had transmitted 100 watts into an amplifier designed to take only 50 watts input.. An amplifier whose original design had not included 17m, and was happier with 40 watts on that band. Roasted plate choke in AL-80A. I switched the amp off and then back on, still dark. Clearly, I've blown a fuse. A quick check verified that one of the two 10A fuses had blown. It was replaced, and the amp came back to life. But as it turned on, there was a tiny arc coming from the plate choke. I switched it back off, turned the meter to the HV setting, and briefly switched it on again. The High Voltage looked fine, but I was going to have to get the amp on the workbench to see what was wrong with the choke. Once I got the cover off, it was easy to see the problem. The plate choke has a black burnt mark. Looking closer, the turns of the choke had melted and separated. The choke would need to be replaced. 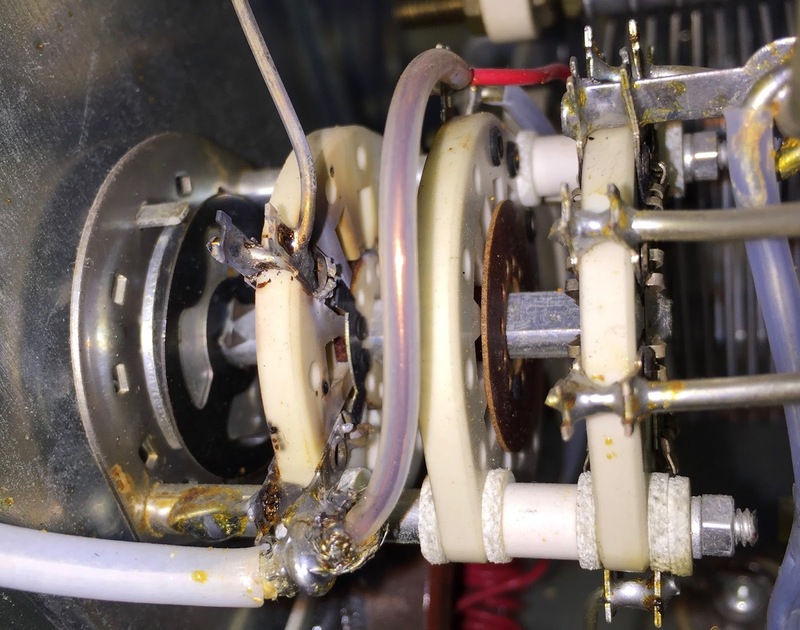 From the location of the burn, it looks like it had arced from the end of a screw on the plate tuning capacitor to the choke. I took the tube out and gave it a quick check with an ohmmeter. No grid to cathode or grid to plate shorts, which was good. The Taylor 3-500Z is pretty darn tough, and likely shrugged off the abuse I had just put it through. Low voltage cap blown to protect meter. While I had the amp on the bench, I checked out a couple of other things. Looks like one of the protective caps I placed on the B- rail to ground failed. Probably helped to protect the meter movements. I'll be replacing that cap, along with the 1N4007 rectifier, since it must have gone open for the capacitor to fail. I'll replace it with the recommend 1N5408 rectifier, which can handle a whole lot more surge current. Another mystery of this AL-80A I solved -- why it wouldn't tune up on 160m. 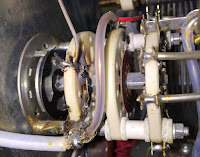 An inspection of the front switch wafer shows that the switch contacts for the additional plate tuning cap have completely melted away. Since I've never used the amp on 160m, this was not me -- this was an existing problem. The switch contacts, or perhaps the wafer will need to be replaced to restore service on that band. I ordered a replacement plate choke from Ameritron. 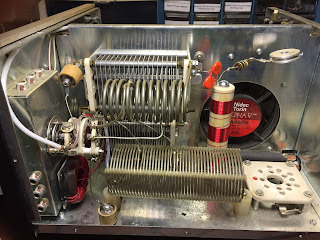 They don't carry the original AL-80A part, but instead use a single choke (Part number 10-15197) for virtually all their amplifiers, including the more modern AL-80B. I've read this part avoids resonances on 17m which may be present in the original single-winding choke. In the meantime, I'll have to chase DX without an amplifier for a while. Perhaps there won't be as many fireworks. Update: I've been told that part of the problem with the 160m switch contacts is the lack of a corona washer. The picture clearly shows an absence of this part. I'll be adding one when I make the repair.